Are you ready to read about one of the most powerful muscle cars out there? If so, then you have brought yourself to the right place to learn about the 2018 Dodge Challenger! New for the 2018 model year is the SRT Demon model, which is something that absolutely everyone has been talking about. If you buy the Demon, then you will be getting yourself the world's fastest quarter-mile car! 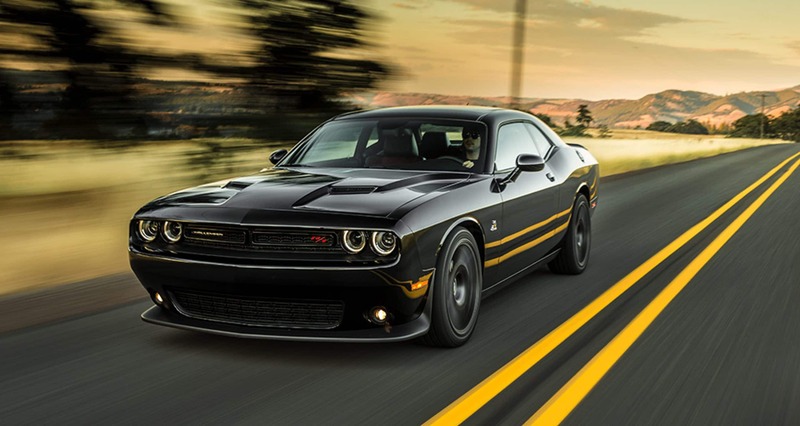 Continue reading to learn all about the 2018 Dodge Challenger, and how this muscle car could be the perfect vehicle for you! What kind of engine does the Challenger have? If you purchase the Challenger in its SRT Demon model, then you will get yourself a supercharged 6.2-liter HEMI V-8 engine. You will also have an SRT three-mode suspension, tuned specifically for the Demon model. The engine is paired up with a TorqueFlite 8HP90 eight-speed automatic transmission, as well as an upgraded transmission torque converter. This transmission torque converter is unique because it will increase the torque multiplication by eighteen percent. The car has an 18.5-gallon fuel tank. Available Drag mode will minimize torque cut during any gear changes. This car may be equipped with 400-millisecond shifts; no slow gear-shift problems here! The car can be purchased with a Brembo high-performance brake package. An available Transbrake will provide a powerful launch to show that this car means serious business! May I have some information on this car's design? Yes, you definitely can! If you are interested in purchasing the widest Challenger ever produced, then consider getting the Challenger SRT Widebody model. The Challenger is available with wide-body fender flares, which are a first-ever feature for a factory-production car. The fender flares emphasize the car's stance. You may also notice the Demon model's wide Air-Grabber scoop, which is the largest functional hood scoop on a car like this. The car comes standard with 18 x 11 inch lightweight aluminum wheels. Seating configurations include a driver and front passenger seat with premium cloth, and a driver seat only with premium cloth. Can you tell me a bit about the Dodge brand itself? As you may know, Dodge is America's mainstream performance brand, based out of Auburn Hills, Michigan. The brand has a long history of producing the best vehicles for peoples' everyday driving needs and wants. With the Challenger, Dodge is showing off its performance roots. This is true with the SRT Demon model, which seriously stands out. The Dodge brand produces a full lineup of vehicles, like muscle cars, full-size SUVs, crossovers and minivans. Many Dodge vehicles feature unmatched capability, class-exclusive technology and various technology features. Do you think that the 2018 Dodge Challenger could be for you? If so, we encourage you to contact us today at East Hills Chrysler Dodge Jeep RAM! Our Sales Department's phone number is (888) 311-7452. Alternatively, you may fill out the online contact form below. When you are ready to come down to check out your possible new ride, we are located at 2300 Northern Blvd in Greenvale! Thank you for reading, and we look forward to helping you find the perfect vehicle here at this dealership!